Proper headrest geometry can go a long way to reduce the chance for a severe injury in the event you are involved in a motor vehicle crash. Since a majority of those with chronic neck pain can attribute their initial injury to a motor vehicle crash it is important to take precautions to reduce your chance for severe injury in the event you are involved in a motor vehicle crash. Your car seat is designed to protect you in the event of a crash but it can only do that if you are using it properly. That means sitting up straight. If you are in a crash it is likely going to be a rear impact crash. When your car is struck from behind your body is going to start moving backward into the seat. Your lower and mid back will be compressed into the seat back and your head will strike the headrest. Depending on your position in the seat and placement of the headrest you can either have a minor injury or a major one. The further forward you are seated from the seat the greater the distance and thus the more speed your body will accelerate to before the seat back stops it. The greater the speed the greater the potential injury you will have. This applies to your head and the distance it is from the headrest. This is why whiplash injuries are common in motor vehicle crashes above other injures. Furthermore if the headrest is positioned too low it can become a fulcrum for your head to bend over and increase the injury to you neck exponentially. The best way to sit in your seat is as close to upright as you can get. Your entire back should be touching the seat back and your head should be touching the headrest. The headrest should be positioned high enough so that the top of the headrest is at least at the middle of the back of your head. Ideally you want the headrest towards the top of your head but that might be difficult based on your body size and the limits in the design of the car’s seat and headrest. It is ideal to have your head touching the headrest but if you need some space do not let your head sit more than 8 centimeters from the headrest. In this side by side series of images from the Insurance Institute of Highway Safety you can see the difference between a good seat and headrest position and a poor one. 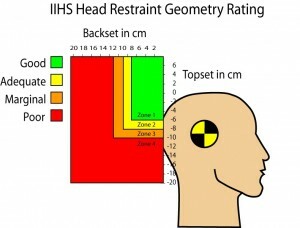 In the top series the headrest is too far back and too low from the test dummies head, it fails to support the head and neck, and becomes a fulcrum for the head to bend over and which would cause a more sever injury. In the bottom series you can see how the head is supported by a properly positioned seat and headrest. The headrest catches the head and keeps it in a good neutral position through the last two frames of the motion. Depending on the speeds involved in the crash the person in the bottom series of images might not experience any pain or minor pain but the person in the top series is going to have moderate to severe neck pain no matter what speed was involved in the crash. 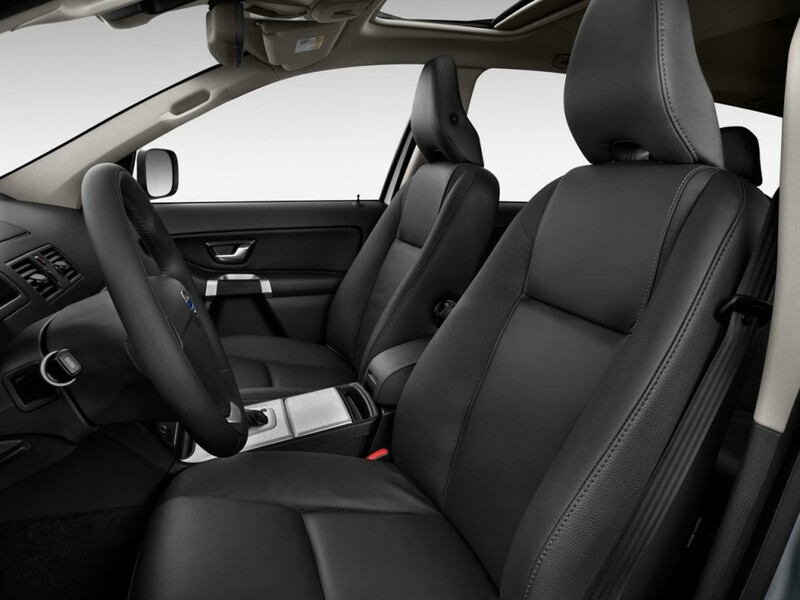 Car’s today are made with safety in mind, this includes headrest geometry. Most newer cars have headrests that are designed to sit forward of the seat back and are tall by default. Probably the picture of occupant safety is Volvo. 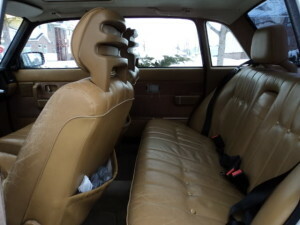 A seat in a Volvo today does not look much different from a Volvo build in the late 1980’s. They have almost always made a headrest that is tall and positioned forward of the seat back. Compare a 1986 Volvo to a 2013 Volvo, while not exact they are very similar and in the 1980’s they were ahead of domestic car manufactures for occupant safety. If you are looking to get your teenage driver their first car look at an old Volvo. An old Volvo can be an economical, reliable, and safe choice. There are other foreign automakers that have great occupant safety designs but in my humble opinion Volvo tops them all. We can never predict if or when we will be involved in a motor vehicle crash but we can prepare for it by taking a few simple precautions. Sitting upright with our head touching the headrest, utilizing proper headrest geometry, is a simple precaution that can significantly reduce your chance for injury. Try not to complain about the headrest in newer cars, it is something that you may be thankful for in the future.